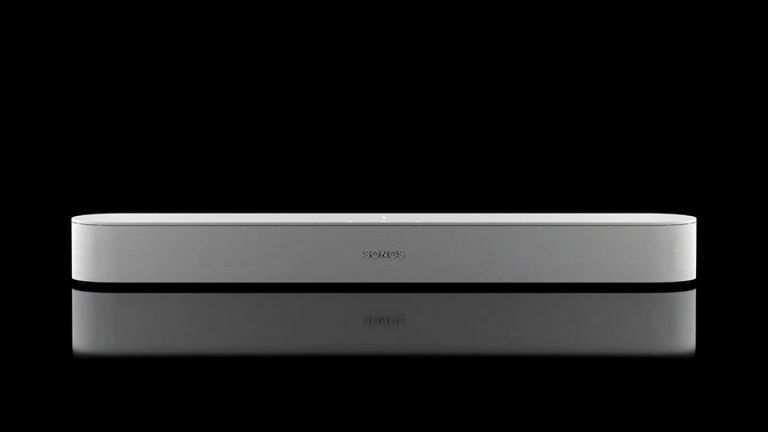 We're live (more or less) from San Francisco, USA and Sonos has just announced the Sonos Beam. It's a compact home cinema (or 'home theater' as the Yanks say) soundbar for the living room. Coming in black or white it boasts Alexa integration, with the promise of support for more voice assistants - Siri perhaps - in the future. That makes it an obvious follow-up to the likes of the Sonos Playbar and the Sonos Playbase which were the company's previous living room efforts. Add one of Amazon’s compatible Fire streamers and the Beam goes a few steps further, adding a whole new level of interest by letting you voice control access to Amazon Prime video, Netflix, catch-up TV and all Fire’s other delights. This FCC filing sketch was the first we saw of Sonos' latest simultaneous assault on the music, home cinema and smart AI markets. Turns out it actually looks like this. Uncannily similar. The purpose of the new box is not just to play music via the Sonos app, which funnels everything from Spotify to Apple Music to TuneIn through Sonos' splendid array of multi-room speakers – with Apple AirPlay 2 support on the way in July across this and The rest of the Sonos range. Beam with Fire will also simplify your TV viewing experience by giving you voice access to the likes of Netflix, BBC iPlayer, Amazon Prime Video, et al (but not YouTube due to a feud with Google). Beam connects to your TV via HDMI ARC or optical digital and can amplify quiet dialogue automatically. It also is no doubt a very proficient part of Sonos’ multi-room audio suite, and can be wirelessly paired to Sonos‘ Sub (woofer) with further speakers able to serve as rear surround speakers. Dolby 5.1 is supported rather than Atmos. • The Sonos Beam goes on sale on 17 July for £399.